A pale pastel blue shade, this colour just screams spring to me. I own A LOT of blue polishes, and although I usually prefer either brighter or more muted blue tones, this is a lovely subtle blue that works great as a light base colour for spring nail art designs. 2 coats, no top coat. A perfect pastel purple. I wear this polish a lot, all year round, but especially in spring. I don't have any polishes similar to this, I don't have enough purples in general to be honest, but this is a purple that is cooler and has a more blue-ish tint that the majority of purples I own. But this has been a spring favourite of mine for a few years now. 2 coats, no top coat. The most recently release polish on this list, part of Barry M's recent Candy Culture collection, this is a purple shade, that leans heavily towards a more pink tone than the previous purple shade on my list. It also has a lovely raspberry scent, although the scent doesn't really impact my opinion in one way or another, it does add a cute quirk to it. Watch my full swatch and review video of this collection here. I love yellow polish. And this is currently my favourite yellow shade that I own. 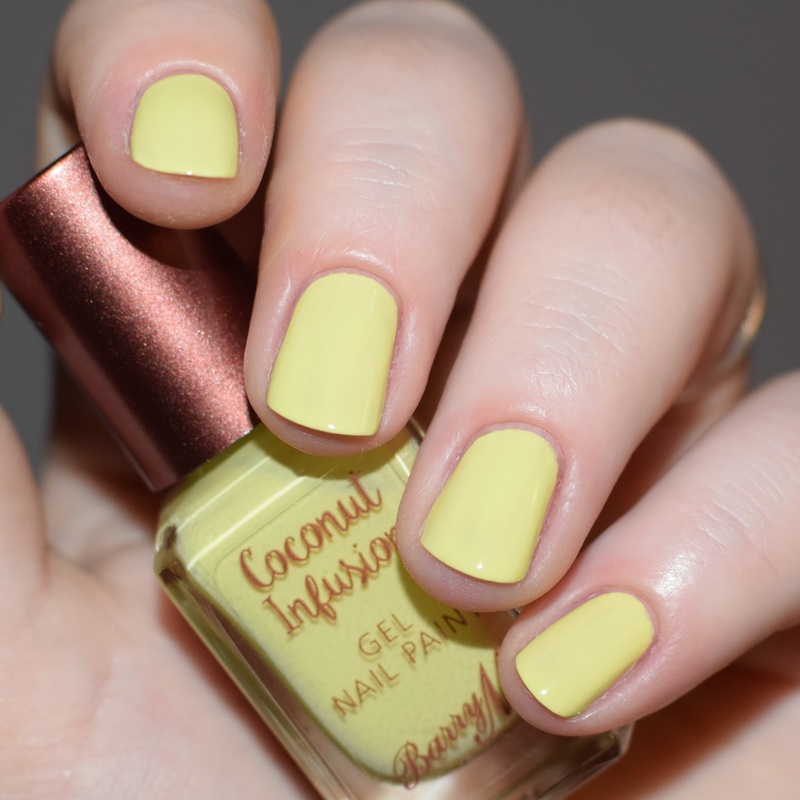 It's part of Barry M's Coconut Infusion collection, which I love the formula of all the ones I've tried. And for a pale yellow it covers perfectly in 2 coats, which isn't often the case. I don't know what else to say about it. I just love it. 2 coats, no top coat. Now I adore lemonade, as you could probably tell. But it is not at the top of my list from pastel spring shades. That's because I am completely in love with this unique shade, Full Throttle. Part of the Speedy Quick Dry collection, it's a pale orange shade. I don't own anything else close to this in shade, and I love how the peachy-orange colour looks against my skin tone, which I don't usually feel for orange polishes. 2 coats, no top coat. What are your favourite spring polishes? Do you prefer pastels on your nail during spring? Let me know in the comments or tweet me @nimynails.